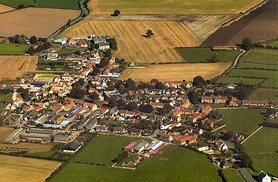 HISTORY: Established in 1894, the council serves the parish of Rainton with Newby, North Yorkshire. WORKING FOR RAINTON AND ITS PARISHIONERS: The Council is committed towards improving the quality of life in Rainton, for the benefit of all its parishioners. Situated in the Wathvale Ward of Harrogate District and the Skipton and Ripon parliamentary constituency. There are 160 households and a population in the region of 300. The Parish Precept for 2018/2019 is £6,500. The council meets on the second Tuesday of each month and members of the public and the press are welcome to attend. The Council will display requirements as to filming, recording and broadcasting at its meeting venues and on its website (if it has one) or on notice boards in the parish and those undertaking these activities will be deemed to have accepted them whether they have read them or not. A copy of these rules/guidance will be provided to members of the public in attendance at a meeting of the Council. The Chairman may also verbally remind the meeting and all present of the freedom to record but that these rules/guidance are in place to enable any type of recording to take place with minimal disruption to the council meeting. Any person wishing to record a meeting in any format whatsoever is encouraged (but not compelled), to contact the Clerk prior to the start of the meeting. The Clerk's details are set out in the public notice and/or agenda of the meeting; (or in his/her absence, the contact will be the Chairman of the Council. Discussing requirements with the clerk beforehand will help to ensure that the council provides reasonable facilities to meet the needs of the person that is recording. The person making the recording may move around, however in doing so he/she must ensure that there is minimal or no disruption to the proceedings of the meeting. A person or persons recording the Council meeting are reminded that the "Public Participation" period may not be part of the formal meeting and that they should take legal advice for themselves as to their rights to make any recording during that period. Where the press and public are excluded from a meeting or part of a meeting owing to the confidential nature of the business to be transacted, recording of that meeting or that part of the meeting will not be permitted. The specific filming of children or young people under the age of 18 who are present cannot take place unless their parents/guardians have given their written consent. This provision also applies to vulnerable adults whereby the consent of a responsible adult is required, ie a medical professional, carer or legal guardian. Where the permission is given, filming of these people can take place. The Council requests that all recording is overt (ie clearly visible to anyone at the meeting), but cannot compel those who are recording to do so. The use of digital and social media recording tools, for example Twitter, blogging or audio recording are allowed as long as this type of recording is carried out in a non-disruptive way and only to the extent that it does not interfere with the ability of any person present to follow the debate. A person or persons making a recording has no right to interrupt a Council meeting by asking questions or making comments for the purpose of the recording. The person recording has no right to ask councillors, officers or any members of the public who have been given permission to contribute orally to the meeting to repeat a statement for the purposes of the recording. The Chairman of the meeting has absolute discretion to stop or suspend recording if, in his/her reasonable opinion, continuing to do so would prejudice proceedings at the meeting or if the person recording is in breach of these rules/guidance. Persons who are recording are requested not to leave their equipment unattended where possible, and are responsible for their equipment at all times. The recording and reporting on meetings of the Council, is subject to the law and it is the responsibility of those doing the recording and reporting to ensure compliance. This will include the Human Rights Act, the Data Protection Act and the laws of libel and defamation. The council expects that the recording will not be edited in a way that could lead to misinterpretation or misrepresentation of the proceedings or infringement of the Council's values or in a way that ridicules or shows a lack of respect for those in the recording. The Council would expect any recording in breach of these rules to be removed from public view. The Council will have no liability for material published by any other person unless it is itself undertaking the publication through its offices. For the benefit for those who wish to record - where the recording device being used involves equipment which is larger than a smart phone, tablet or compact camera or if the person recording has other special requirements he/she is requested to please contact the clerk prior to the meeting so that reasonable arrangements can be made. The use of lighting for filming/flash photography will usually be allowed provided that it does not adversely impact on the ability of others present to view the meeting, or for reasons of health, whereby the council may require that such lighting is not used or is reduced to a level which does not adversely affect other people. The lighting should not cause any other form of disruption. The Council may itself photograph, film, record or broadcast meetings and can retain, use or dispose of such material in accordance with its retention and disposal policies. Where a Council proposes to record all of its own meetings it will be bound by this policy. Where a Council proposes to record all of its own meetings, it will resolve how long such recordings will be kept and how members of the public may obtain copies. The Council will include the availability of such recordings within its Publication Scheme. The Council is not liable for the actions of any person making a recording at a council meeting which identifies a member of the public or for any publication of that recording. The minutes of a council meeting remain the statutory and legally binding formal record of council decisions. The above policy was adopted at a meeting of Rainton with Newby Parish Council on Tuesday 9th September 2014 and amended 9th June 2015..